Invercargill became the vintage car capital of the world for two weeks in January, when the NZ Vintage Car Club held its 60th Anniversary International Rally. Around 970 vintage and classic cars took part, some being shipped from overseas especially for the event, ranging in age from 1903 to the 1960’s. 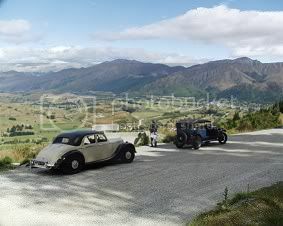 The South Island roads are renowned as being some of the best in the world for vintage car events, reflected in the 300 overseas competitors from Europe, USA, Scandinavia and Australia. Many of the overseas entrants borrowed vintage cars from NZ enthusiasts; others shipped their own vehicles from as far away as England. The highlight for many was the public show day at Oreti Park, with all 970 cars on display. An estimated 14000 locals came to see the cars which produced the biggest traffic jam ever seen in Southland, with queues of up to 3 hours to get into the park. Competitors had various organized runs to places of interest such as Te Anau and the Catlins, as well as a timed gravel hill climb and a thrash around Teretonga Track for the sporty types. Just as important was the social side of the event, with organized meals and entertainment every evening in the huge Southland Stadium. There was a Rock n’ Roll night, a Scottish night, and a German Beerfest night complete with oompah-pah band. A dinner and a prize giving on the final night was attended by over 1900 people. I only spotted 3 side-valve English Fords, and I think they were all South Island cars, a Prefect (approx 1950), a 7W (approx 1939) with a 10HP motor, and a beautifully restored Fordson truck which seemed to be at full revs everywhere it went. My wife Pat and I took our 1953 Riley, which covered over 5000km in the two weeks including the drive to Invercargill and back, without missing a beat. We had been planning this trip ever since reading about the last big International Rally based in Christchurch 10 years ago to mark the 50th Anniversary of the NZ Vintage Car Club. And it lived up to all our expectations, especially the empty roads and beautiful scenery in Southland, and the wonderful Southland people who did everything possible to make the visitors welcome. Definitely an under-rated part of the country.